Unlike me, F does not have a sweet tooth. Though he gladly munches on the desserts I make, he likes to have savory snacks around for those pre-dinner flashes of hunger. When I saw this recipe for savory cookies (those exist?!) on The Kitchn, I knew that I had to make them. Obviously savory is not the first thing you think of when you hear the word “cookie,” but these cookies ought to convince you that the two are a wonderful marriage of flavors and textures. The rosemary adds depth and the parmesan and sea salt give the cookies just enough saltiness, while the olive oil smooths everything out nicely. As far as cookies go, these are quite healthy — there’s no butter, just a touch of sugar, and half the dry ingredients are oats. Next time I might even try using whole wheat flour rather than the white stuff to kick the nutrition up a notch. Preheat the oven to 350F (175C) and line a baking sheet with parchment paper. In a large bowl, stir together the oats and the water. In another bowl, mix up the oil, sugar, and egg. Add to the oat mixture. In a third bowl, whisk together the dry ingredients, then stir in the cheese. Add this mixture to everything else and stir until combined. 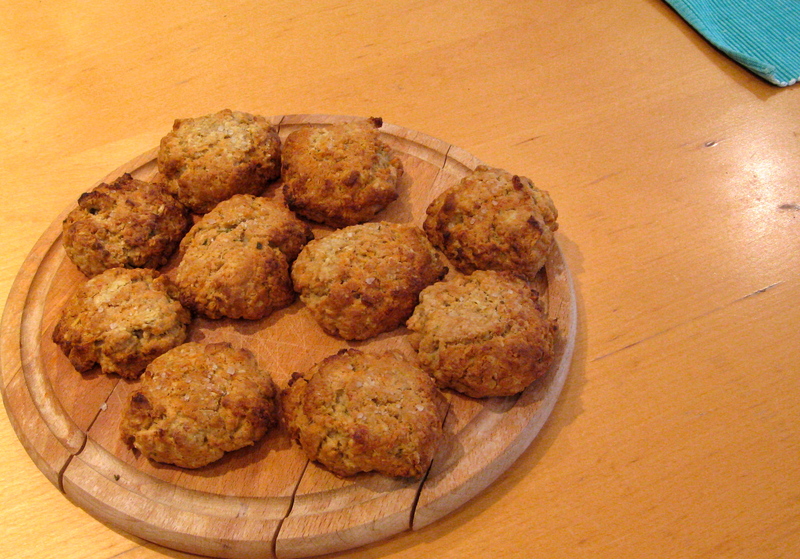 Place flattened balls of dough on the cookie sheet, sprinkle a bit of sea salt on top of each, and bake for 15-17 minutes. Enjoy plain or with a schmear of butter or soft cheese. This entry was posted in food, health, pictures, recipes on 12.04.2013 by taplatt.